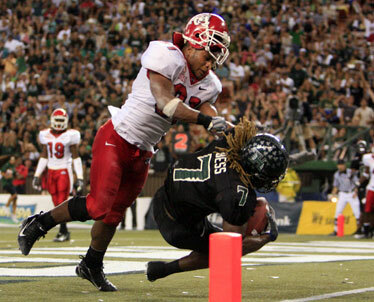 Fresno State linebacker Marcus Riley lost his helmet putting a hit on Hawaii receiver Davone Bess as Bess scored the touchdown that tied Colt Brennan with Ty Detmer for most career TD passes. What did Fresno State's Marcus Riley think of The Hit Heard Round the Stadium? Over the span of several minutes, the senior linebacker's emotions ran the gamut. "It's tough, because I started to celebrate, and when he (Hawaii quarterback Colt Brennan) was still down it kind of changed my whole attitude about the situation," Riley said. On third and 7 at the Warriors' 24-yard line with Hawaii up 37-23 with 10 minutes, 43 seconds left in the fourth quarter, Brennan was flushed out of the pocket. He managed to elude a couple of tackles. Then the Heisman Trophy hopeful froze for a moment -- right in the path of Riley. Brennan was absolutely demolished by the blow as the 220-pound linebacker ran clean over him. The sound was audible from the stadium's distant press box. Riley and the Bulldogs began celebrating the big stop, but elation quickly turned to worry, then dread when Brennan remained on the Aloha Stadium FieldTurf, surrounded by the training staffs of both teams. The Bulldogs took a knee and coach Pat Hill anxiously paced around the congregation. After several minutes, Brennan got up and woozily walked off the field to loud applause. But he didn't return and Fresno State gave Hawaii a nervous run down the stretch, clawing to within 37-30 behind key plays from quarterback Tom Brandstater and the Bulldogs' platoon of running backs. Riley's thoughts kept going back to the hit. But he hesitated to call it the hardest of his career. "I was kind of nervous," Riley said. "I kind of relaxed after I knew he was alright, when he got up, started moving around. I didn't really know what to think. I was hoping it wasn't anything major and nothing serious. I didn't want anybody to get hurt, but injuries are a part of the game. I'm just glad he's alright." Brennan was diagnosed with a mild concussion, upgraded from a more severe concussion. Hill went over after to the Warriors' locker room after the game to check on Brennan. "Oh, he'll be fine. He recognized me," Hill quipped. Riley was instrumental in helping hold the Warriors to a season-low three points in the second half, as he intercepted Brennan in the end zone midway through the third quarter. "They had me beat on one where they scored a TD and I was a little bit late," Riley said of the first pick of his career. "I knew if they ran that play again I'd be right there on it. What a great quarterback to get it on, a Heisman hopeful who's set so many NCAA records ... my first interception on somebody of his caliber."